Anthropologist Christopher Hallpike has spent decades studying religion and morality in a wide variety of world cultures. 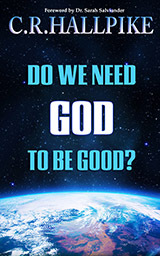 In Do We Need God to Be Good?, he examines moral philosophies that range from primitive paganism to advanced secular humanism, as well as the sciences that attempt to study them. Dr. Hallpike’s insight into the human condition is unique, as he has lived among tribal societies in Ethiopia and Papua New Guinea as well as the academic elite of the West. His scientific observations are fascinating, his logic is sound, and his scrutiny of evolutionary psychology, from the perspective of an experienced professional anthropologist, is among the most comprehensive scientific critiques of a popular theory ever published. Featuring a Foreword by astrophysicist Sarah Salviander, Do We Need God to Be Good? is a brilliant examination of an age-old question by a renowned scientist.